4 years ago I lost 60 lbs. Maybe someday I'll write about that journey. It was both hard work and very easy. I have also beat the statistics by keeping the weight off. It's that mostly part that bothers me sometimes. The truth is that in the last 4 years I have never gotten anywhere near putting all the weight back on. I have found it easy to keep at least 40 lbs down from my top weight. It's those last 20 lbs that have a tendency to creep back on when I'm under stress. And then I have to get all disciplined with myself and work them back off again. The thing is, it was easier to stay motivated to lose weight the first time when the results were dramatic and everyone around me was encouraging me. No one notices when I am struggling to take off those final 20 lbs, again. I have now completed 2 month long diet bets and have doubled my money. Basically the way it works is you put up a certain amount of money to enter a bet. You then have four weeks to lose 4% of your body weight. Everyone's money goes into a pool, the diet bet people take their cut and at the end of 4 weeks the pot is split between everyone who managed to lose at least 4% of their body weight. I knew that losing 4% was very doable for me but that I would have to work on it. I knew myself and knew that if I put money up, there was no way I was going to let myself fail. For me diet bet was the perfect way to keep myself accountable and on track. The last day before my last weigh in I was at a March Madness party and I know I would have overeaten if it wasn't for the bet. 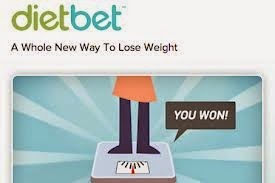 I'm not getting paid by dietbet or anything, I just thought it was a cool concept that worked for me and some of you might want to know about it. You can get a group together and do a bet or you can just join in one. You can do up to 3 at a time. I just joined a public one. I put up $60 originally for 2 different $30 games that ran at the same time. I then plowed some of my winnings back into another 2 games the following month. When I won those games also, I decided I was too close to goal weight to want to do more bets so I cashed out at $131. Yup, I live on the edge. *Mostly just because the winnings are paid out via paypal and when I went to pay for the SAT I saw the paypal option and thought, why not.